1. (verb) (-ngia,-tia) to tend carefully, foster, attend to, care for, cherish. Emerging from our annual Hui this year on the practice of Dana was an expressed need for more flow of information and communication between the Board of Trustees, Caretakers and community. This would keep the community better informed of the day-to-day running of the Centre and also offers valuable practical and energetic support to the Board of Trustees and Caretakers by widening the circle of awareness and involvement. Community members expressed a willingness to help when they know what is needed, and the Board members expressed a sense of relief in knowing that the wider community is there to offer support. We are now trialling a new pocket in the Newsphere, “Kumanu Wangapeka”, to tend to this need by offering more regular communication about what’s happening “on the ground”. It is our intention that this serve the needs of the Community in cultivating healthy, open communication, and a greater sense of connection with the running of the Centre. Even for people living at a distance we hope that it helps to nurture a sense of inclusiveness and involvement in what is unfolding at the Wangapeka, and inspire people to get involved wherever they can. May it strengthen support and generosity on all levels, for the benefit of Wangapeka and all beings! A call for cushions – After many many sits, our meditation cushions are well worn and a bit tired. If you have any spare meditation mats or cushions you may like to donate, or have the sewing skills and time to offer to create some new ones, please be in touch with Faith. If you are interested in cooking for retreats at the Wangapeka, please contact Faith to add your name to our list of wonderful cooks. Our cooks receive a fee, free accommodation and food while cooking and are often invited to join in the retreats they are cooking for. A major repair to the ceiling was carried out in July and August. The old GIB ceiling had become contaminated with rat urine. Local builders replaced it with a plywood ceiling, repaired some of the outside soffits and blocked up more holes where rats were thought to be entering. The new ceiling was sealed around the edges and along the joins with silicone sealer and timber beading, and then painted. The attic side of the ceiling was painted with a waterproofing against further rat incursions and new pink batts installed. The attic space had a vent installed at each end by Matthew. Just before Bonni began her solo retreat Matthew repaired some damage to the inside walls of the main room and painted them. After work to close it in was completed, the focus moved to Sky Dancer in preparation for Bonni’s retreat. However, a number of small jobs continued to be ticked off. Guy added vertical wall battens, rehung the doors, added the verandah roof edges, and began preparation for the guttering. Chris has added steps and railing up to the verandah. Graham has added the framing and architraves to the inside of the windows. The hole for the long-drop is being dug. New large diameter culverts have been installed on the main driveway in 3 critical places by a local drain layer and Guy. The labour weekend working bee cleared the cool store, scrubbed, washed and painted the inside, and new shelving was installed. May all our communications bring love, clarity and peace to all beings! 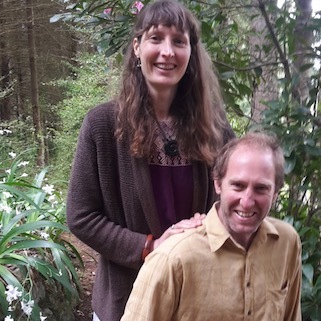 Dakinis in the forest Banner Pic: Kath, Ronnie and Amber in the Namgyal Sanctuary at the recent honouring of the life of Namgyal Rinpoche led by Keith Rowan and attended by about 25 members of the community.